Kinkaku-ji 金閣寺 is undoubtedly one of Kyoto’s shining landmark. Literally, it shines. Known as The Golden Pavilion for its gold leaf gilded facade, this temple is many photographers’ dream of a perfect water reflection. When the sun hits the right spot, its exterior gleams and glitters like a gem. Its reflection in the waveless waters of the surrounding pond is nothing short of magnificence. Before we even beheld the razzle-dazzle of Kinkaku-ji, we were bewitched by the entrance path to the temple grounds, lined on both sides with Japanese maple trees. Resplendent with flaming reds and bewitching oranges, it was such a joy to just stroll towards the entrance. Following signs to the entrance, a huge stone indicates that Kinkaku-ji, less commonly known as Rokuonji 鹿苑寺, is a UNESCO World Heritage Site, alongside a wooden board which notes the temple’s history. Through the entrance, we were immediately greeted by the golden splendor of Kinkaku-ji. The encircling pond, the couple tree island within the pond, the large pine tree bowing elegantly in the foreground, and the myriad of trees in the background, all add to the scenic beauty of this historical monument. 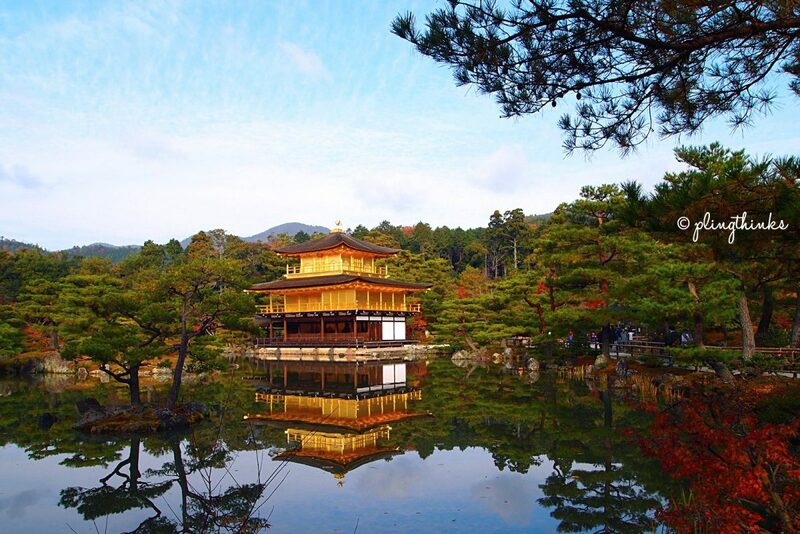 One can easily mistake the three-storey Kinkaku-ji to be fully laid with gold leaf. The 2nd and 3rd floors of its facade have been gilded with gold leaf over its lacquered surface, while the 1st floor is constructed in the style of a nobleman’s residence in the Heian period. Burnt to the ground in 1950 by a maniac monk and reconstructed in 1955, Kinkaku-ji was restored to its golden glory in 1987. One cannot enter the Golden Pavilion. Views of its magnificence from across the pond also included squints into the 1st floor, where the doors are usually kept open. Capped on top is a golden phoenix, which looks resplendent against blue skies and Japanese pine trees. During autumn, when the surrounding hills of Kinugasa-yama 衣笠山 deck out their oranges and reds, and when the Japanese maple trees within the temple garden proudly display their autumn colors, the view of Kinkaku-ji reminds one of a painting. The subject is set against a breathtaking, natural background and the foreground conjures the meditative, reflective essence of water. The autumn colors play here was strong! Sadly, the path strewn with Japanese maple leaves was not open for walking, closed in by a little wooden gate, whose top was overgrown with moss, accentuating the warm vibrant colors of the fallen leaves. The other side of the Golden Pavilion offers a view framed by a Japanese maple tree, albeit no water reflection. pling thinks…it’s just as gorgeous! Travel Tip: Kinkaku-ji, being on most travel itineraries, can get crowded real fast and by the busloads. The area for viewing the Golden Pavilion across the pond is not large. To enjoy the view and for less jostling, go early before the crowd and tour buses hit from 10am onwards. The cheapest and easiest way to get to Kinkakuji, without taking a cab, is by bus. There is no JR station near Kinkaku-ji. We generally avoid taxi rides in Japan due to its relatively high cost for a traveling party of 2. It might make more sense for short distances if your party is 3-4 pax, but grappling with the unknown ticking fare sets off some alarms so we usually avoid unless it’s an emergency or simply unavoidable. From Kyoto Station, take the Kyoto City Bus 101 or 205. Do not take the Rapid 205 (急速205) as it doesn’t go to Kinkaku-ji. Alight at Kinkakuji-michi 金閣寺道 after traveling for about 30 – 40 minutes.